Throughout the region, there are a myriad of entertaining things for the entire family. Here, we’ve highlighted just a few of our favorite things to do. 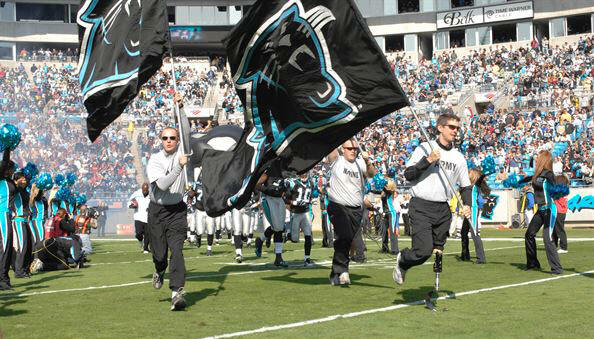 For fans of professional sports, there’s nothing more exciting than joining more than 75,000 fans in Charlotte’s downtown Bank of America Stadium to watch the National Football League (NFL) Carolina Panthers football team play during the fall. Playing in Charlotte’s Spectrum Center, basketball fans enjoy watching the National Basketball Association (NBA) Charlotte Hornets play during the winter and spring. This vibrant atmosphere is fun for the entire family with a wide array of concessions and fun activities during the games. The Charlotte Knights, the region’s minor league baseball team, recently moved into the new BB&T Park in uptown Charlotte. Home games have become a popular outing for families, as they enjoy numerous family-oriented theme nights and affordable tickets prices. This 2,000 acre motorsports complex features a 1.5 mile quad oval track that hosts NASCAR’s prestigious Coca-Cola 600, the NASCAR All-Star Race and the Bank of America 500; as well as features ZMAX Dragway, a state-of-the-art quarter-mile drag racing strip which hosts NHRA events. Home to some of the most premiere college athletics programs in the Country, USC participates in 12 sports: baseball, basketball, cross country, equestrian, football, golf, soccer, softball, swimming and diving, tennis, track and field, and volleyball. The Winthrop University Eagles provide plenty of college sports action for residents to enjoy, as between the men’s and women’s teams, the Eagles field 17 sport teams including baseball, lacrosse, basketball, golf, volleyball and track and field. As the largest amusement center in the Carolinas, Carowinds’ 100-acre park features a new, massive waterpark; Fury 365, which is the world’s tallest and fastest giga coaster; as well as numerous other high adventure activities, concerts, shows and more. Historic Columbia Foundation offers museum tours, walking tours and guided bus tours of Columbia's cultural and historical assets, which includes the Robert Mills House, Woodrow Wilson Family Home, Hampton-Preston Mansion, and Mann-Simons Cottage museums and their associated artifacts. Riverbanks Zoo & Botanical Gardens is home to more than 2,000 fascinating animals and one of the nation's most beautiful and inspiring botanical gardens. The lush 170-acre site features dynamic natural habitat exhibits, scenic river views, spectacular valley overlooks and significant historic landmarks.